FRANKFURT, Germany, September 16 (ENS) – The Frankfurt Motor Show is the site of Germany’s first Tesla Supercharger, installed just two weeks after the California electric carmaker began its European Supercharger rollout in cities across Norway. The Supercharger provides free, fast battery charging, but its specialized equipment fits only Tesla electric cars, such as the Model S, the Motor Trend Car of the Year that Tesla is now, for the first time, offering in Europe. 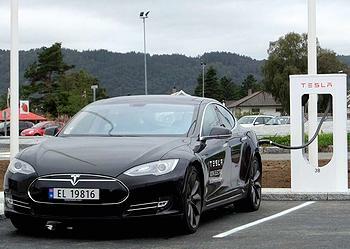 The free charging for Tesla drivers – the equivalent of getting free petrol for the life of your car from another automaker – helps to offset the high price of the Tesla Model S.
In France, for instance, the Model S with a 60 kWh battery sells for €64,760 (US$86,560). The Model S with a 85 kWh battery sells for €75,150 (US$100,400) in France and delivers the unprecedented range of up to 500 kilometers (310 miles). Supercharging is included with every Model S that is equipped with an 85 kWh battery, and can be added to any 60 kWh Model S for US$2,000, or $2,500 if enabled after delivery. Superchargers are capable of charging a Model S many times more quickly than other charging stations. Superchargers provide half a charge in about 20 minutes, delivering up to 120 kW of DC power to the Model S battery using special cables that bypass onboard charging equipment. Some Supercharger stations feature canopies covered with solar panels to offset energy use and provide shade. Over the next few years, Tesla plan to cover more stations in sunny locales with solar canopies as part of the company’s environmental commitment. Late last month, at the same time that the Model S hit European roads, Tesla energized the first Superchargers in Europe. 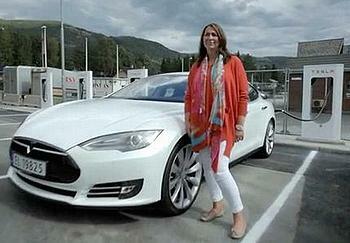 On August 30, the European rollout of the Supercharger network began in Norway. Superchargers were energized across the country, connecting six of Norway’s major cities with the capital, Oslo. With locations in Lyngdal, Aurland, Dombås, Gol, Cinderella and Lillehammer, Model S drivers can travel for free between these cities along Norway’s most used roads and highways. More European routes will have Superchargers in the coming months, the company aims to provide coverage within the Model S rated range of 480 km per charge. By the end of 2014, 100 percent of the population of Germany, the Netherlands, Switzerland, Belgium, Austria, Denmark and Luxembourg will live within 320 km of a Supercharger station. About 90 percent of the population in England, Wales and Sweden will be living within the same distance of a charging station, also by the end of next year. Drivers will be able to pull up and plug in, take a quick break, and get back on the road with confidence in their power supply. Tesla has 21 Supercharger stations across North America today. By the end of fall 2013, the company plans to install them in most metropolitan areas allowing for coast-to-coast travel by winter 2013. In 2014, 80 percent of the U.S. population and parts of Canada will have access to Superchargers and by the end of 2015, the fast chargers will be available to 98 percent of the U.S. population and parts of Canada, the company says. Founded in 2003, Tesla Motors is named after electrical engineer and physicist Nikola Tesla. The company’s first production car, and the world’s fully electric sports car, the Tesla Roadster, uses an AC motor descended directly from Tesla’s original 1882 design. In 2009 Tesla began producing the Model S, a electric luxury sedan, the first to be built from the ground up as an electric vehicle. Deliveries of the Tesla Model S in Europe started this summer. The first European deliveries of the Model S took place this August in Norway, to be followed by Germany, Belgium, Denmark, Iceland, Luxembourg, the Netherlands, Spain and Switzerland. George Blankenship, Tesla’s vice president, worldwide sales and ownership experience, said that at first only 60 kWh and 85 kWh cars will be imported into Europe, not the 40 kWh car. Tesla’s new European Distribution Center in Tilburg, Netherlands will serve as the company’s European service and parts headquarters, as well as the final assembly and distribution point for Model S vehicles sold in Europe. To date, Tesla has delivered over 15,000 electric vehicles to customers in 31 countries. The Frankfurt Motor Show, also known as the Internationale Automobil-Ausstellung (IAA), opened to the public on September 12 and will run through September 22.